Rapid reaction units from BAOR were on a moments notice to go anywhere in the world including The Falklands, The Gulf, Bosnia and Kosovo. Introduced in 1970 Ptarmigan was a secure ‘mobile phone system’, the mast and backroom all transportable. During the troubles in the Province 13 Officers and Soldiers of the Royal Corps of Signals lost their lives. A memorial to the fallen is situated in Palace Barracks, Belfast. Anyone requiring further detail should refer to the Volumes of Corps History or arrange to visit the research facilities in the Museum Archive and Library via the Museum’s Research and Archive facility. The British Army has served in Germany since the end of the Second World War, first as an Army of occupation then as part of NATO. A large number of Royal Signals personnel have served in Signals units with BAOR. Rapid reaction units from BAOR were on stand-by – to move at a moments notice – to anywhere in the world. Contingents from the Royal Signals in BAOR took part in the Falklands campaign and in the Gulf War and were part of the peace keeping force in Bosnia and Kosovo. There is a wide range of equipment in the Museum covering service in BAOR. The transition from Bruin, a trunk communications system that followed the chain of command, to Ptarmigan is depicted. Bruin was introduced in 1968 as an ‘interim measure’ to cater for the operational needs of the Cold War years. Lasting almost 25 years, Bruin was basically an ‘off-the-shelf ‘ buy, an interim measure whilst a true area system was being developed. That system was Ptarmigan a bespoke system which emerged in 1970 but wasn’t fully operational until 1985. When Ptarmigan entered service, voice telephonic communications were the norm, making-up 90 per cent of the load on the network. Ptarmigan is like a whole, portable mobile phone system – complete with kit, mast and backroom. Ptarmigan was running computer networks and digital information systems so at the time, the extent that you could communicate within the military was astonishing. Over time the voice requirement remained stable but the requirement for data transmission grew exponentially. Today approximately 10 per cent of the traffic is voice and 90 per cent data. Intelligence, surveillance, target acquisition, and reconnaissance (ISTAR), imagery and other information is key. This change in the type and nature of communications led to Ptarmigan being replaced by Falcon (introduced in circa 2010) and designed by BAE Systems. Falcon is a tactical trunk communication system which provides a wide area network (WAN). Designed to deliver secure voice and data over an IP (Internet Protocol) system across multiple security domains, it requires less man-power to operate than Ptarmigan. Falcon uses All-IP-based technologies rather than a mix of asynchronous transfer mode and IP systems; importantly it can be set-up and dismantled rapidly. 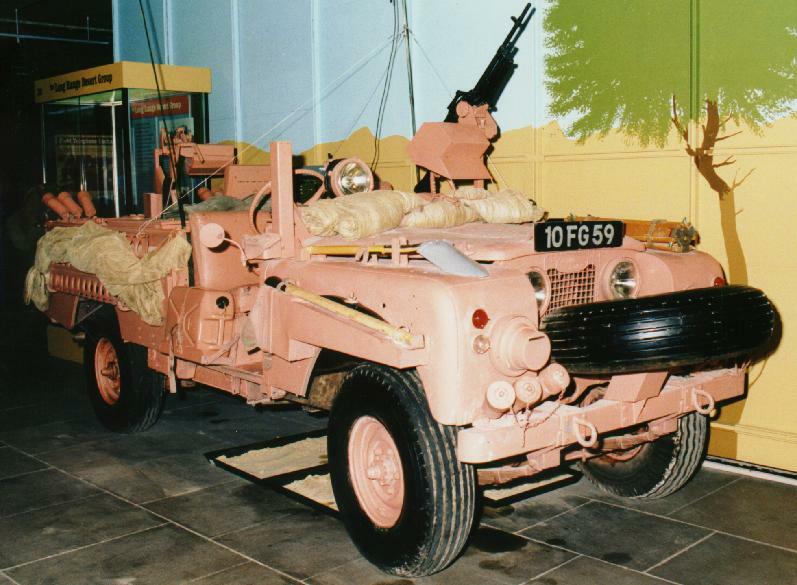 The original Ptarmigan system with portable banks of dials, switches, computers and controls designed to go inside a military vehicle – is installed in the Museum. 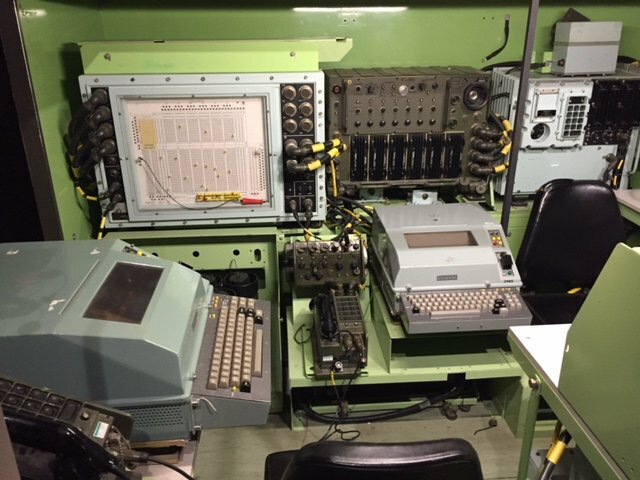 BAOR Kit – The Museum is home to examples of equipment used in this period including: field telephones, teleprinters, Electronic Warfare and other specialist kit. The Fish Fryer (officially named the ‘3/4 Ton Body Comms Equipment’) was a specially designed portable covered trailer towed by a landcover, that could house a variety of equipment. A C50/R236 Radio Relay Station was used in the BRUIN system from 1968 to about 1985. The post-war Larkspur range of radios was introduced in 1958 to replace the war-time sets. In the late 1970s Larkspur was replaced by Clansman. 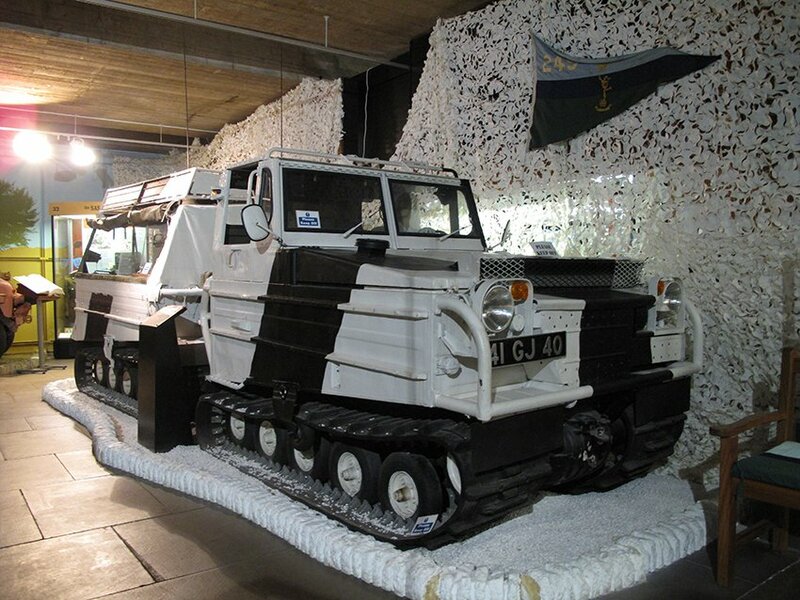 Bandvagn BV202 “Snowcat”, 1962 – 1981. This one was used by 249 Signal Squadron in Norway and was fitted with Larkspur. From the outset of the Korean War British sea and air forces were involved but land forces were not. In August 1950 HQ Land Forces Hong Kong were ordered to despatch 27 Infantry Brigade in time to participate in the battles around Pusan. Following the arrival of Australian Troops 27 Infantry Brigade was joined by 29th Independent Infantry Brigade and renamed 27th Commonwealth Brigade . The Brigade remained independent until it amalgamated into the 1st Commonwealth Division in Summer 1951 when it became 29th Commonwealth Brigade. 28th Brigade replaced 27, and the Canadian 25th Brigade also joined the fray. In July 1951 these units were united to form the Commonwealth Division under 1 US Corps. 1st Commonwealth Division Signal Regiment was formed and soon became responsible for 4,000 miles of twin cable of the “Static War” which lasted until 1954. This was followed by the 1st Commonwealth Division Independent Signal Squadron which was eventually disbanded in 1956. There was a separate unit for the Commonwealth Line of Communications. Initially it was called Britcom Independent Line of Communications Signal Squadron but was later renamed the British Commonwealth Communications Zone Signal Squadron and included a troop of Royal New Zealand Signallers. The excellent co-operation and efficiency of the communicators of Britain, Australia, New Zealand and Canada working together was impressive. One of the Corps’ paintings, “The Last Transmission”, depicts the Commanding Officer of The Gloucester Regiment, Lieutenant Colonel Carne DSO, and his Royal Signals Rear Link operators on 25th April 1951. They are involved at the Imjin River and Lance Corporal H Jennings is destroying the No 62 set and Signalman Cairns is burning the codes as the Chinese hoards overrun 29th Brigade. Despite the severe problems associated with terrain and climate including the hasty recall of reservists and the use of a lot of obsolescent equipment, the Korean War was a great success for the Corps. The immediate post-war Signals involvement in Cyprus was minor with Cyprus District Signals relying almost entirely on local fixed communications run by civilian personnel. In 1955 the British Army withdrew entirely from Egypt and HQ Middle East Land Forces was set up in Cyprus where, in anticipation of self-government, a struggle for power was ensuing. EOKA, a Greek Cypriot nationalist guerrilla organisation wanting union with Greece, launched a four year campaign of terror and sabotage. 1st Infantry Division Signal Regiment came to Cyprus from Egypt in 1955 to form the Cyprus District Signal Regiment. The peace agreement of 19 February 1959 proved unworkable and UNFICYP (United Nations Peacekeeping Force in Cyprus) was established and has remained ever since. Kit – In the late 1950’s units such as 50 Infantry Brigade Signal Troop operated B44s mainly with National Service men. 19 and 62 Sets were also in use. The Field Exchange 40/160 replaced the Field and Fortress exchange and was used extensively in operations in which line communications were essential. The exchange provided 40 lines and four exchanges could be arranged in tandem. It was operational until the late 1980s and was used in Cyprus. ‘The Corps history in Northern Ireland is an astonishing record of bravery by individuals but little will ever be fully published on account of security’ – The Vital Link. Prior to the most recent troubles in Northern Ireland (which began in the late 1960s and lasted approximately 30 years) there were just two Royal Signals Squadrons and a TA Regiment in the province. Following the escalation of the troubles the total force occasionally reached 20,000 withThe Royal Corps of Signals providing the second largest element of the force (only the Infantry provided more). The main Regular Army Signals structure was based on a HQ Communications Branch. In the late 1980s the Squadrons were grouped into 15th Signal Regiment which had originally been disbanded in Aden following the British withdrawal in 1967. Communications and Information Systems in the Province remained at the forefront of technology. Today 15 Signal Regiment is based in Blandford and currently provides a combination of deployed and ‘reach back’ Information Support (IS). Following the Northern Ireland peace agreement (The Good Friday Agreement signed in 1998), just two signals’ squadrons remain there. Larkspur. At the outset of The Troubles Larkspur radio was used; the range included the A41, C11 and C4. Commercial radio. Larkspur was supplemented by commercial radio – mainly PYE and Stornophone. Much of the early communications was by land-line using secure or less than fully secure systems. Heli-Teli. Soldiers of the Corps were responsible for operating the GEC-Marconi Heli-Teli which was the helicopter mounted ‘spy in the sky’. This was used from 1975 to the mid-90s and there is a specimen in the museum. Clansman. By 1982 about 10,000 commercial radios had been purchased and Clansman had been introduced. More sophisticated use was being made of cryptography and of modern technology over fixed lines and radio relay. The Museum exhibits tell of the many deployments undertaken by Royal Signals in support of UN and NATO. These deployments include Aden, Dhofar Congo, Kenya, Rwanda, Rhodesia, Arabia, Turkey and Namibia – to name but a few. Forty men from The Royal Corps of Signals were killed in action in Palestine. The British Mandate in Palestine, granted after World War 1, was due to expire in 1948 but peaceful progress towards self-government for the region was impossible. The British Army, finding itself in the middle of a power struggle between Arab and Jewish inhabitants, was attacked by both sides with British Troops suffering regular attacks from guerrillas. To protect Britsh interests troops remained in Egypt until 1955 only to return a year later in 1956, as part of the Suez Operation (following the nationalisation of the Suez Canal by the Egyptian Government). The Suez Crisis (also named the Tripartite Aggression, and the Kadesh Operation) was an invasion of Egypt by Israel, followed by Britain and France. The primary aims of the invasion were two-fold: to regain Western control of the Suez Canal and to remove Egyptian President Gamal Abdel Nasser from power. The operation was a military success for Anglo-French forces but due to the opposition of the United States, the Soviet Union, and the United Nations, who forced the three invaders to withdraw, a political disaster. During the years up to the end of the Second World War Special Operations Executive (SOE) groups were established in Malaya to link up with the Communist guerrillas. When on 13th September 1945 all the Japanese surrendered, the Communists raised their flags in many of the principal towns. By 1948 the Communist Terrorists (CTs) were advancing to power in the country and the Malayan Emergency was declared. To many, the Emergency became one of the forgotten conflicts of the post-war era; to historians it became one of the few successful Internal Security operations. The campaign was waged in the jungle, on the hills or in the towns but the nature of the guerrilla conflict was such that no ‘front line’ existed. Kit – The main forms of communications in such an environment were HF tactical radio (e.g. the No 53 set) and line; use was made of Malay Telecommunications. VHF was used primarily for short range tactical deployments and maintaining communications was a never ending task. There are examples of A40 and A41 radios which were short range man pack VHF sets with ranges up to about 10 miles. The war came as a surprise when, on 2nd/3rd April 1982, Argentine forces attacked and occupied British colonies on the Falkland Island and South Georgia. Six hundred officers and men of the Royal Signals subsequently took part in the conflict. The British Task Force set out from Portsmouth on 5th April 1982. The initial Royal Signals involvement was with the SAS detachments who had been covertly deployed to obtain information about the enemy. One especially brave effort by Sergeant JG Mather, led to him being awarded the Military Medal. Kit – 30 Signal Regiment put up a Communications Centre at the staging post on Ascension Island and Royal Signals detachments provided Rear Link communications from most fighting units. By 1st June 1982, 5 Infantry Brigade HQ and Signal Squadron had landed at St Carlos using mainly Clansman radios. 30 Signal Regiment, with detachments from 1 and 19 Infantry Brigade Signal Squadrons, formed a unit to support the Land Forces HQ. 50 Signallers ran 15 nets on HMS Fearless which was the Main Force HQ. 30 Signal Regiment also provided satellite communications back to UK and secure telegraph for two Brigades (The satellite detachments are pictured on the cover of The Vital Link – The Official Corps History). The Royal Signals were tasked with providing both long distance communications from the Gulf region back to UK, and tactical communications within the theatre of operations. Interoperability with allies was a major technical challenge. The Gulf War also saw the use of Electronic Warfare equipment under armour for the first time in the British Army. A major aspect of the use of communications as a potent weapon was in deception; the nature and location of the main Allied attack was concealed and falsified by the use of extraneous transmissions by Signallers. Kit – The Gulf War saw the first operational deployment of Ptarmigan. This complete mobile area system provided secure telephone, facsimile, data and telegraph facilities to any user anywhere on the battlefield. The system was also extended world-wide by satellite links. Much of this equipment was not designed to work under desert conditions and air conditioners and air filters were employed extensively. The war also saw the introduction of a plethora of ‘off-the-shelf’ Information Systems. Many of these were managed by Royal Signals and the provision of appropriate communications for them was a major technical commitment. The climatic and geographical conditions provided considerable challenges to communicators butThe Clansman family of radio equipment worked extremely well in the adverse desert conditions. Russian radio sets used by the Iraqi Army along with other equipment were captured and can be seen on display in the Museum.